The story of the English Bible is an epic narrative spanning hundreds of years filled with intrigue and bloodshed, heroes and antagonists, all fulfilling the purposes of God in the preservation of His Word. Several critical moments throughout this incredible history prepared the way for key men of God to translate the Bible from the original languages into English. Remarkably, a few of these complete first-edition Bibles still exist, some with history reaching back more than 500 years. Truth Remains founder David Parsons has entrusted his extensive collection of 16th – 17th century Bibles to the ministry purposes of Truth Remains. This rare, pristine collection includes a complete set of the most significant first-edition English Bibles, including the extremely rare Tyndale New Testament. Truth Remains uses these Bibles as a tool at conferences and special events to bring the stories and lessons of church history alive in an engaging way, raising the believer’s awareness and appreciation of Scripture. See below for pictures and brief descriptions of the first-edition Bibles from the Truth Remains exhibit. Contact us about hosting Truth Remains at your church or event! In 1522 William Tyndale began translating the Bible into English from the original languages at a time when it was illegal to do so. The Latin Vulgate was the only translation authorized by the Roman Catholic Church, making Scripture inaccessible to the layman. Believing in justification by grace alone through faith, Tyndale boldly challenged core Catholic teachings, risking his life so that "the ploughboy would know more of the Scripture than the priests." 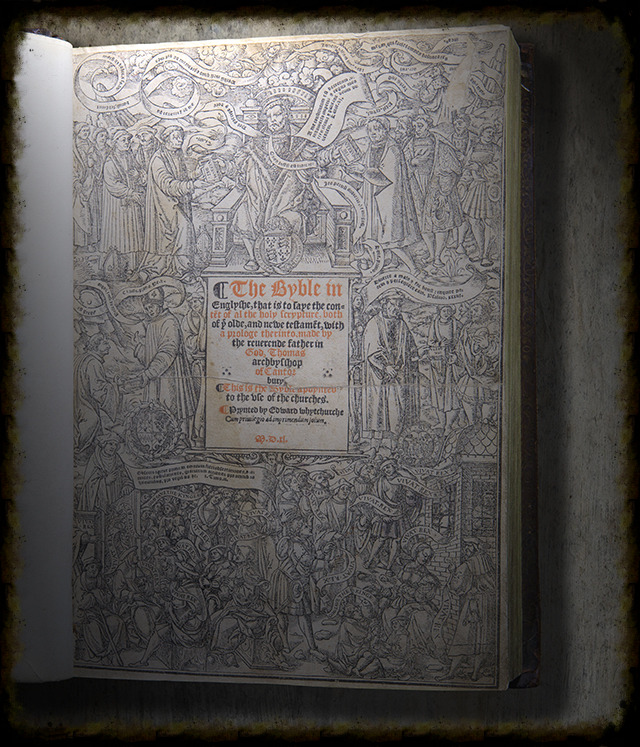 Tyndale’s New Testament was published in 1526 and God’s Word was unleashed in England. The impact of Tyndale's work cannot be overstated. His pioneering scholarship played a key role in spreading Reformed theology throughout England, and was the foundation of subsequent translations until after the Second World War. Tyndale shaped the English language, creating words like "beautiful" along with phrases such as "let there be light." William Tyndale’s New Testament was condemned by Catholic officials in England. Tyndale was betrayed by a friend and turned over to authorities to be strangled to death and burned at the stake. His final words were, "Lord, open the King of England's eyes!" Two years before William Tyndale was martyred, he providentially met an Orthodox Catholic priest named John Rogers. Th e two became good friends and Rogers came to faith in Christ shortly after. In May of 1535, William Tyndale was arrested and his property confiscated. Incredibly, Tyndale’s translation work was not taken but transferred safely to the possession of John Rogers, who would finish the work of Tyndale in 1537 under the psuedonym, “ Thomas Matthew.”  The Matthew Bible was the first English Bible translated from the original languages. Rogers printed the initials "WT" at the end of Malachi to honor his martyred friend. John Rogers was put to death in 1555. He saw his youngest child for the first time just before he was burned at the stake. Rogers was the first of many Protestants martyred at the hands of Bloody Mary. Known by several diff erent names, the Great Bible, or the Whitchurch Bible, was the only English Bible to be authorized by the crown. King Henry VIII commissioned the scholar Myles Coverdale, and chief minister  Thomas Cromwell, to supervise its creation for use in the Church of England. Th e Great Bible was basically an edition of the Matthew Bible without Tyndale's notes. It was published in 1539 and dubbed "great" because of its large format. Th e people of England were so hungry for God’s Word that clergy had to chain the Great Bible to church lecterns in order to prevent theft . Eventually King Henry grew concerned about the consequences of allowing the lower classes to read the Bible and later placed restrictions on its editions and uses. 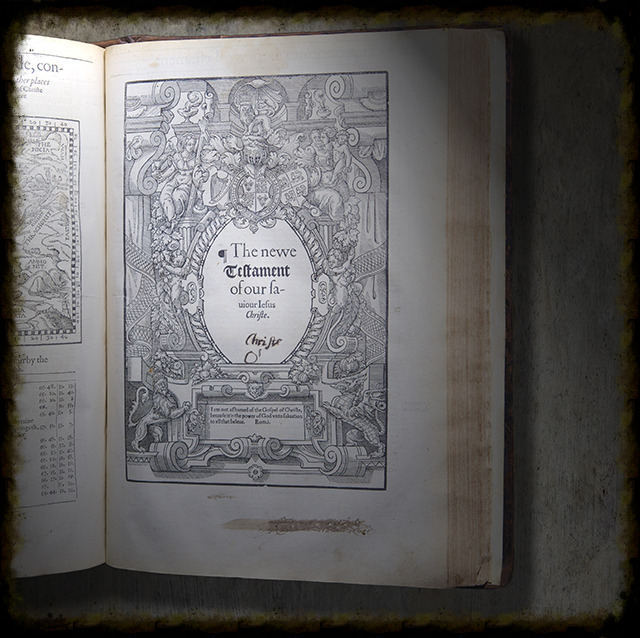 Th e Great Bible was printed continuously, until Bloody Mary’s ascension to the throne in 1553. Named after the city in which it was published, the Geneva Bible was the most influential Bible of the 16th and 17th Centuries in England, Scotland, and the American Colonies. The Pilgrims brought the Geneva Bible to America on the Mayflower in 1620. 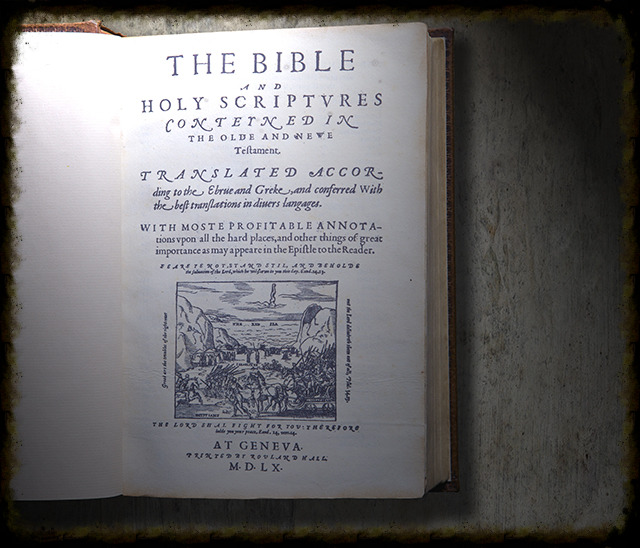 It became the household Bible of English speaking Protestants for three generations, and was the very first study Bible. This masterpiece of Renaissance scholarship, printing, and Reformation Bible-thoroughness was completed in just three years. Archbishop Parker may not have brought us poetry, but the Bishops' Bible helped pave the way for the most influential translation in history. In 1604 King James I of England approved a request for a new Bible translation, seeing it as an opportunity to be rid of the controversial study notes contained in the Geneva Bible. Around 60 men divided into six companies worked on the new Bible, including translators, project overseers, editors, illustrators, and engravers. Roughly 85% of the King James Bible was adapted from William Tyndale’s translation with as much as one-third of the text being word for word from his work. Today, the King James Bible is the best selling book of all time, over four-hundred years aft er the first edition came to  the press in 1611. It is the greatest and most influential book of the English-speaking world, with well over a billion copies printed. Interested in having these Bibles at your church or conference? Contact us about hosting the Truth Remains display.